I was texting with my wife, and all of a sudden the time stamps didn't seem to line up right for awhile. As you can see, it seems as if some of my responses were sent to her before she sent her texts. After this sequence, everything went along normally though. This is due to the clocks being out of sync - I've noticed that when the clock on my wife's phone is slow, they show slow on my phone, and fix as soon as I update the time on her phone. One thing I have noticed is that the "set time automatically" setting is rubbish, so you're at the mercy of drift on the clocks, or regular checking if your network doesn't support the setting of date/time automatically. Not the answer you're looking for? Browse other questions tagged 8.0 sms or ask your own question. Is it possible to forward an SMS? 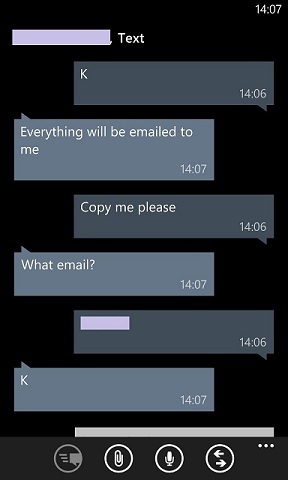 How to check if someone is using my Windows Phone? Is there an App to automatically forward SMS to email? Custom SMS ringtone for authentication SMS?